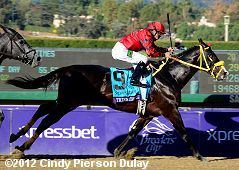 A full field of 14 older horses went to post in the $1.5 million Xpressbet Breeders' Cup Sprint (G1), a 6 furlong trip around one turn of the main track. 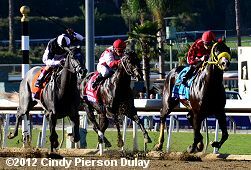 Defending champion Amazombie was sent off as the 7-2 favorite off a fourth place finish in the Santa Anita Sprint Championship (G1) after winning the Bing Crosby (G1). In to challenge him included 4-1 second choice The Lumber Guy, winner of the Vosburgh (G1) at Belmont, and 6-1 third choice Coil, second in the Pat O'Brien (G1) before winning the Santa Anita Sprint Championship. Jockey Julien Leparoux gunned 29-1 Sum of the Parts out of the chute first through an opening quarter in 21.41 while stalked by 13-1 Trinniberg. On the far turn, Trinniberg gained a short lead through a half in 43.73 and quickly opened up a 1 1/2 length advantage in midstretch through 5/8 in 55.52. The Lumber Guy, who tracked the leaders in third, put in a late rally but Trinniberg held him off by 3/4 length in 1:07.98. It was a long 2 1/4 lengths back to 21-1 Smiling Tiger third, while favorite Amazombie checked in 8th. 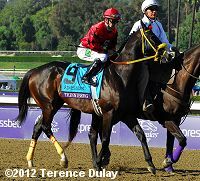 Left: Trinniberg heads to the winner's circle. 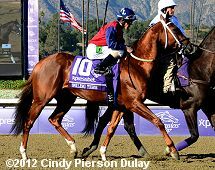 Owner Sherry Parbhoo said, "We were confident in our horse. We knew that Trinniberg would be a good horse and it's just an amazing experience to be here with my family and Willie and we're very happy to be here." Trainer Shivananda Parbhoo added, " When he ran the last couple of races, every time he reached the 1/8 pole, he would lose confidence in himself, because he always at the 1/8 pole most of the time he was a length, two lengths. So I said, wait, you know, this horse need something. In order to keep him focused, from the 8 pole to the wire, that was my biggest problem, that he would not get?? not focus on the race and with the blinkers, it surely did work." Right: Trinniberg in the post parade. 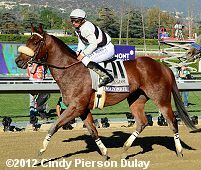 Jockey Willie Martinez said, "You can dream it, you can feel it, but when you taste it, it's a totally different thing. I never lost confidence in him. He's been running against the best sprinters all year, I figured if I was first or second turning for home, he was going to be very tough to beat. This means the world to me." Left: Second place finisher The Lumber Guy returns after the race. 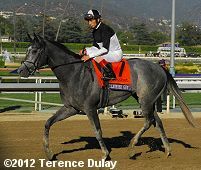 Jockey John Velazquez said, "We had a good trip, second-best I guess. But he ran very good. I was watching (Trinniberg) and he was going well. I was just hoping I would get to him. I did at the quarter pole, but then he opened up another length on me. I thought 'wow, it's going to be tough to beat him,' and it was." Right: Third place finisher and beaten favorite Smiling Tiger in the post parade. Trainer Jeff Bonde said, "This is certainly a tough race to make a comeback in. I'm very proud of him. He ran great, despite it all. 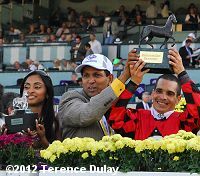 Ramon (Dominuguez) said he got a little tired at the end, but he still ran great." Jockey Mike Smith added, "He wasn't himself today. I don't know what it was, but something was wrong. I knew around the turn that we were in trouble. He quit running, and it was like he didn't want to be here." Eighth place finisher and beaten favorite Amazombie returns after the race. 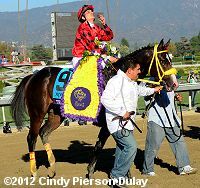 Jockey Mike Smith said, "He wasn't himself today. I don't know what it was, but something was wrong. I knew around the turn that we were in trouble. He quit running, and it was like he didn't want to be here."